There are many ways to build your own greenhouse. You can purchase a kit that includes all the materials and add your own labor and expertise to erect the greenhouse. You can build a frame and use PVC, clear plastic, or even recycled soda pop bottles to create side panels, as a gardener in Scotland did to demonstrate a completely eco-friendly greenhouse solution. You can even convert an existing shed, shop building, porch or storage facility to a greenhouse. With so many choices, you may not know where to start, but a simple assessment of your skills and budget will guide you in the right path. Before selecting a kit, plan, or other do-it-yourself method, consider all the ramifications of building a greenhouse from scratch. 'How are your handyman skills?' Are you comfortable pouring concrete, erecting a frame, handling glass panels or otherwise installing a greenhouse? Or would you be more comfortable with a simpler model? 'What is your budget? 'Full greenhouse kits, including metal frames, glass panels and mechanical or electrical vents, cost hundreds if not thousands of dollars, depending on the model. A simple greenhouse made from wood 2 x 4s and recycled pop bottles costs much less; you may even be able to find recycled or used wood for the sides. Consider how much you're willing to spend on your greenhouse project. 'What will the greenhouse be used for?' A simple greenhouse is sufficient to winter over houseplants, tropical plants and tender annuals or start seedlings in the spring. A more elaborate or larger greenhouse may be necessary if you wish to grow vegetables year-round for sustainable living or commercial ventures. 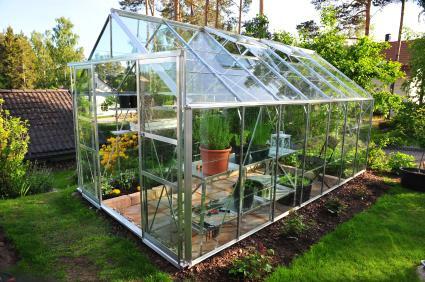 Depending on your answers, you may wish to explore one or more of the following options to build your own greenhouse. Greenhouse kits provide the plans and materials to erect a complete greenhouse. Most include the template and instructions for the foundation; you'll have to build the foundation yourself, which may involve mixing and pouring cement. Some provide materials for freestanding greenhouses of various sizes while others include materials for a three-sided or lean-to greenhouse. Such a greenhouse uses an existing garage or house wall as the fourth side of the structure. GreenhouseKit sells a large assortment of greenhouses, from elaborate structures to PVC-plastic covered hoop houses, at prices to fit many budgets. Mini Greenhouse Kits also sells greenhouses ranging from small hobby greenhouses to large commercial greenhouses. Before selecting a greenhouse kit, keep in mind a few things. First, you will need to be comfortable with many different tools including an electric drill, screwdrivers, hammers and more. You may need an electrician to run electricity to the greenhouse for lights, heat and automatic vents, which help keep the temperature stable inside. Also, include the cost of laying a foundation. While you may choose to do without electricity and simply set the greenhouse on level patch of earth or gravel, some kits require a cement foundation. Look at all the options and include such considerations into your purchasing decision. Some adventurous and handy homeowners purchase blueprints, plans and books, and build a greenhouse from scratch. Such greenhouses typically use PVC pipe and sheets of plastic to form the greenhouse; both materials are affordable, attractive, and easy to work with. Many frugal living and sufficient living websites provide plans and personal advice on building simple greenhouses from scratch. Frugal Living Freedom offers several ideas for building your own greenhouse. PVC Plans offers a free greenhouse plan you can download and print, made with PVC pipes and sheets of plastic. Sherry's Greenhouse offers links to many plans and ideas to build your own greenhouse from scratch. Cool House Plans offers blueprints for sale to help homeowners build a greenhouse. While this isn't a common way to build a greenhouse, it offers an intriguing, eco-friendly idea. TreeHugger.com shared photos of a wood frame and pop bottle greenhouse constructed at Byker Farm, Newcastle Upon Tyne, in the U.K. The article states that this project may be a good project for children or for a school garden. Children enjoy getting involved and collecting pop bottles used to build the walls. Plans, details and photos are available on TreeHugger. If you live in a gated community or a development, check to make sure there are no building covenants or restrictions on your property that might forbid construction of a greenhouse. You should also check with your local county clerk's office to determine whether or not you need a building permit to erect a greenhouse. If the greenhouse includes running water and electricity, your town or county may also require a building inspection or require the structure be built to adhere to the county or state code. Such factors vary considerably and are governed locally, so the only way to know for sure is to call or visit your town or county office.